The topic “Politics, Civil Society and Participation” is dedicated to the fundamental question: How do media and communications practices within European cultures change with their environment? This volume consists of the intellectual work of the 2015 European Media and Communication Doctoral Summer School, organized in cooperation with the European Communication Research and Education Association (ECREA) and a consortium of 21 European partner universities at the ZeMKI, the Centre for Media, Communication and Information Research of the University of Bremen, Germany. 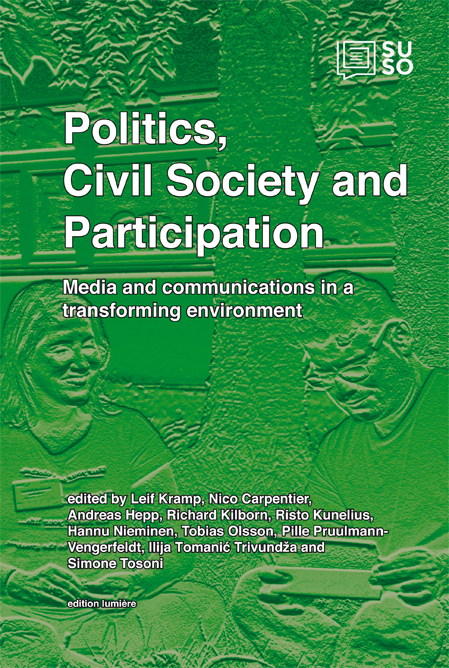 The chapters cover relevant research topics, structured into four sections: “Policies and politics of communication”, “Civil participation in and through the media”, “Media representations and usages” and “On methods”. The European Media and Communication Doctoral Summer School brings together a group of highly qualified doctoral students as well as senior researchers and professors from a diversity of European countries. The main objective of the fourteen-day summer school is to organize an innovative learning process at doctoral level, focusing primarily on enhancing the quality of individual dissertation projects through an intercultural and interdisciplinary exchange and networking programme. This said, the summer school is not merely based on traditional postgraduate teaching approaches like lectures and workshops. The summer school also integrates many group-centred and individual approaches, especially an individualized discussion of doctoral projects, peer-to-peer feedback — and a joint book production.